The BCE 6ft pool table FP-6 is not only compact and durable, but it is also equipped with a fantastic space saving storage facility. When you are not playing, you have the option to store the table vertically out of the way, and the integrated castor wheels then allow you to move the pool table around. 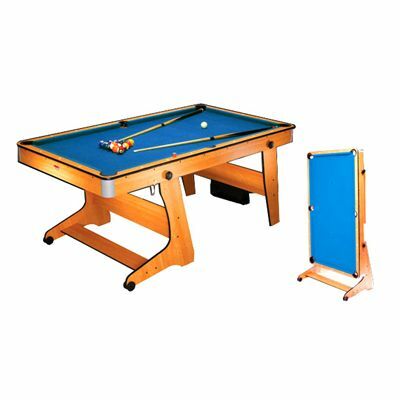 This is a great and fun pool table when you want to impress your friends and family but have limited living space. The laminated beech effect finish with reinforced corners ensures this table is also a very stylish and robust option. The table is supplied with two cues, a triangle, a chalk and a set of 1 7/8” (48mm) balls. for submitting product review about BCE 6ft Folding Pool Table FP-6.